without any problem at all. It has been amazingly reliable and most certainly gets the job done. I set it at fifty degrees and monitor its performance throughout the space with a humidistat. We routinely have power outages each summer and because of Auto Restart, as the saying goes the Comfort-Aire keeps going and going. For the price, I do not expect it to last forever but I certainly think it gives good value for the money. 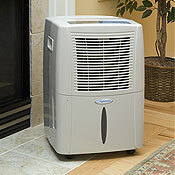 Basement Dehumidifiers: When Do You Need One?